Buy Palladium: All Commodities Down! In the fast few weeks we've seen the prices of EVERYTHING drop! If you want to buy palladium now is the time, that's for sure! Oil is down to $63 a barrel. That's cheap oil. I truly believe the government is doing their best to keep it down. And, while oil is down you'll find palladium cheap. Palladium follows platinum and silver which more or less follow gold, but swing at higher percentages. Silver, palladium, and platinum have dropped around 60%. Gold only around 30%. So, what can you infer from this? Buy palladium online now if you can find it. 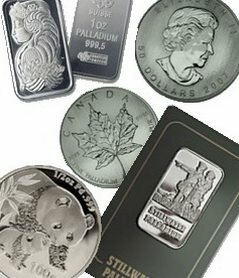 I'm looking into buying silver instead of palladium because with fees on palladium expensive like they are, you're paying double! The key is to buy a from the big gold companies. The drawback of doing that is that if you want palladium coins, they're going to make you buy a minimum of 10 oz or so. You can buy just one 1 oz coin palladium. The Dow is down too. This isn't new news (I haven't updated this blog in well over a week). The Dow is in the mid-8000s. And precious metals took another 5-10% dip last week too. Looking at history, you'll see that gold and oil rise and fall similarly (at the time of this entry I haven't found one, but I'll find a chart to attach here). And you'll see that as the stock market goes down, oil and gold go up. So, is everything going to stay down? Frankly, I'm surprised. I thought gold would shoot up with the stock market fall. What's funny, EVERYONE is buying gold now too, as it's cheap! Rare palladium is the bad result for us! As an industrial metal manufacturers have a use for palladium whether its price is up or down. I believe, that like oil, the government is manipulating the gold price and keeping it down, in order to keep the dollar from collapsing. This is something interesting and I don't know how it relates: the dollar has fallen 10% versus the yen in the past week. Why? It could be due to the yen carry trade I think. Looks like everyone is now having to pull all their investments purchased via cheap yen. So yen is rising and now everyone doing same with the dollar. I think the Yen is now topping out on its climb, before is sinks like a stone. But dollar still has a way to go, so its soaring up now as people also dumping assets purchased with dollars. But I am only guessing. But yen carry trade was massive, so if I am correct the dollar climb will not last as long as the yen climb has. I have been mystified lately because the price of metals are dropping at a time one would think the opposite. Yeah, the past few months have been pretty strange (I'm referring to the last part of 2008). The all time highs of mid-summer '08 aren't surprising, but the prices falling back to current levels in March '09 are a bit of a shock. Bad economy = high metal prices is what I was hoping! Hey, I loved the yen's price jump. I had $1000s of dollars in yen and I cashed out when the dollar was only worth 90 yen! Thatnks for the comments, BTW, guys!